On May 13th, we were fortunate to have 2002 MBA Alumni Ken Takai return to IUJ and present a session on professional career development. Ken works in the Tokyo office of recruitment firm DHR International, and is a seasoned professional of the headhunting world. With years of experience, he is well aware of what organizations are looking for in potential candidates. The atmosphere at the session was lighthearted and casual, but full of useful information about what to expect from Japan’s job market. Ken started off by speaking about his work experience after studying at IUJ, and covered theories on career development from modern organizational psychologists. Different theories have unique approaches to the concept of a career, the work we’re drawn to, and what our underlying motivations are. Having a basic understanding of these can help you identify an organization that’s the right fit for you. Ken went on to discuss some useful tips on finding and applying for jobs from a headhunter’s perspective. He emphasised the importance of completing a SWOT analysis and identifying your strengths, weaknesses, opportunities and threats when it comes to finding work in Japan. Ken spoke about job hunting being like a sporting competition, and knowing what you can offer that your competitors can’t is one of the key factors that will ultimately win you a position. He also noted that if you apply for a role within a Japanese organization, interview processes may be different to what you’re used to. In many countries one or two interviews may be the norm, but here in Japan having several interviews is par for the course. Session participants were shown a video about Japanese interview etiquette (you can find the link here), where factors like how many times you knock on an interviewer’s door, what you wear, and how you bow are all taken into consideration. Understanding these cultural nuances is important if you plan to work for a Japanese company, but if you’re working at a multinational company within Japan they may not be emphasised as much. When it comes to interview questions, Ken said that when he trains new headhunting consultants he always places importance on the STAR technique. The acronym stands for situation, task, action, and result, and it’s known as competency based interviewing, where a potential employer can see how you respond to different workplace challenges. Practicing some sample answers following the STAR technique was one of his suggestions – for instance, answering a question like “tell me about a time where you handled a difficult situation”. Covering all four of the steps of the technique when you answer should give your potential employer a good understanding of what you can offer as an employee. Ken also went over the recruitment channels used in Japan for finding staff. Direct recruitment is still most common, but recruitment agencies and even social media are also used to obtain candidates. For students, he placed importance on attending seminars, job fairs and career forums, registering yourself on job hunting websites, or even enlisting the help of a recruitment agency to match you with a position after graduation. 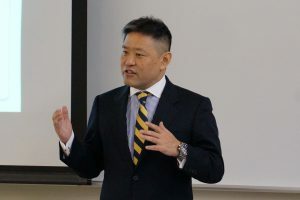 Ultimately, he stressed that IUJ students, have plenty to offer the Japanese job market, with unique assets that can be applied to many employers. This event is organized by the Graduate School of Interntional Management Council.